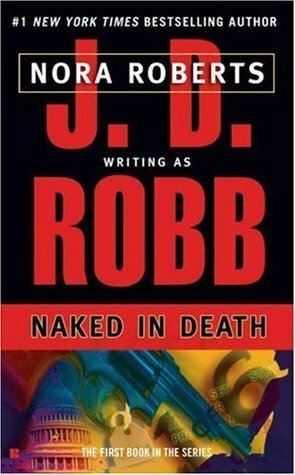 Today I'm featuring Naked in Death by J.D. Robb. The excerpts shared are from a paperback edition I borrowed from the library. Page 56: "I've heard of them. Still hear about them. You think Rockman's involved with a fanatic splinter group like that?'" My thoughts: This is the first book in prolific bestselling author Nora Roberts's (writing as J.D. Robb) futuristic suspense In Death series featuring lady cop Eve Dallas. 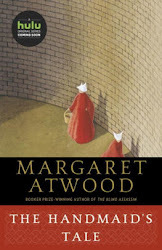 It's been on my to-read list forever, but a recent conversation with a good reading buddy who has read all of them made me decide to finally dig in. Some--including me--may question my sanity at starting a series of 44 books (and a 45th is scheduled to be published in September 2017), but it feels right, and the opening drew me in immediately. From Goodreads: In a world of danger and deception, she walks the line--between seductive passion and scandalous murder... Eve Dallas is a New York police lieutenant hunting for a ruthless killer. In over ten years on the force, she's seen it all--and knows her survival depends on her instincts. And she's going against every warning telling her not to get involved with Roarke, an Irish billionaire--and a suspect in Eve's murder investigation. But passion and seduction have rules of their own, and it's up to Eve to take a chance in the arms of a man she knows nothing about--except the addictive hunger of needing his touch.